Once again, the Friends of the Benjamin Library hosted the very popular book sale at the end of February which was a huge success. For those of you who may have missed the event, please remember that there is an ongoing book sale in the reading lounge. If you are interested in contributing more to the amazing Friends group and the library, please consider joining our Friends and lending a hand. On Friday, March 9, the library will host The Uniqueness of the San Diego Region program presented by Dr. Phillip Pryde. This engaging informational event will showcase why San Diego has always been one of America’s most unique counties. The program will begin at 2 p.m. and is generously sponsored by our Friends of the Library group. Tax Help at the library continues this month on Mondays and most Tuesdays. Older adults, or those with limited income, are welcome to have their taxes prepared by AARP volunteers. This program is offered on a first-come, first-served basis and takes place on Mondays from 9:30 a.m. to 4 p.m. and Tuesdays noon to 4 p.m. Please note that there will be no Tax Help on Tuesday, March 27. Our display cases are filled with orchids this spring. They look real, but were actually handcrafted by artist and library patron, Porntipa, aka The Orchid Lady. We are glad that she did! Now our display cases are filled with her glorious floral art. Each blossom and leaf is meticulously crafted from pressed fabric and foam, painted and then coated in latex. Even by looking closely, you will find it hard to believe these orchids did not grow naturally. Start your weekend off right with our new STEAM (Science, Technology, Engineering, Art, and Math) Storytime. Each week we will read some fun stories, sing some catchy tunes and of course do some weird, quirky, magical science. Children of all ages are welcome. Our Saturday, April 7, STEAM Storytime will take place on the grounds of the future Allied Community Gardens. Everyone is welcome to join us for a fun project and prizes for this Arbor Day event. Proceedings start at 10 a.m.
We continue to offer storytimes for babies, toddlers and preschoolers throughout the week. As well as our popular adult programs. Please visit the branch or check out our Facebook page for a schedule. How is your hand eye coordination? Are you a skilled gamer? Do you have a love for video games? Well, guess what? The library now has a PlayStation 4! Want to come test out your video games skills against fellow teens and tweens? Now is your chance, every Wednesday from 12:30 to 2:30 p.m. you can test out your controller skills and see who is the best gamer in the library. Do you like playing board games? Sharing some laughs with friends? Testing out your competitive nature? If you answered yes to these questions then this program is for you. Every Thursday 3 to 5:30 p.m., the community room will host a variety of board games that will test your knowledge, skill, endurance and talent. For teens and tweens. No sign up required. The teens and entire staff here at the Allied Gardens/Benjamin Library would like to give a big shout out and thank you to Chris and his amazing team at the Allied Gardens Grocery Outlet for their weekly donations of snacks for our teen and tween programs. We really appreciated your support of the library and our young patrons! We are very excited to welcome our new library assistant, Rachel Johnson. Rachel is a San Diego native who has been with the library for six years. She has been very involved with the city’s mentoring program which provides training opportunities to youth for future job success. In her spare time, Rachel enjoys playing softball, cooking, crocheting and, of course, reading. Please note that the library will be closed on Friday and Saturday, March 30–31, in honor of Cesar Chavez Day. We will open for our regular hours on Monday, April 2, at 9:30 a.m. Thanks for reading and we look forward to seeing you at the library! 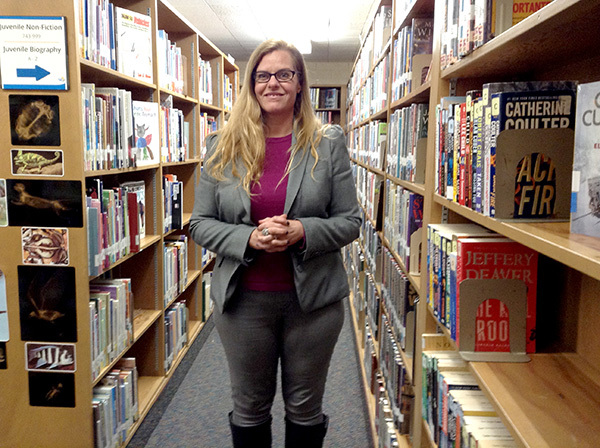 — Kathryn Johnson is managing librarian of the Allied Gardens/Benjamin Branch Library. Reach her at johnsonka@sandiego.gov.